Well, can you believe the first day of the last month of 2018 is already here? I was totally not prepared for this and only when the reminder for the calendar came on my phone I realized it is time to share the December 2018 Calendar Wallpaper for the readers of desi Traveler blog. 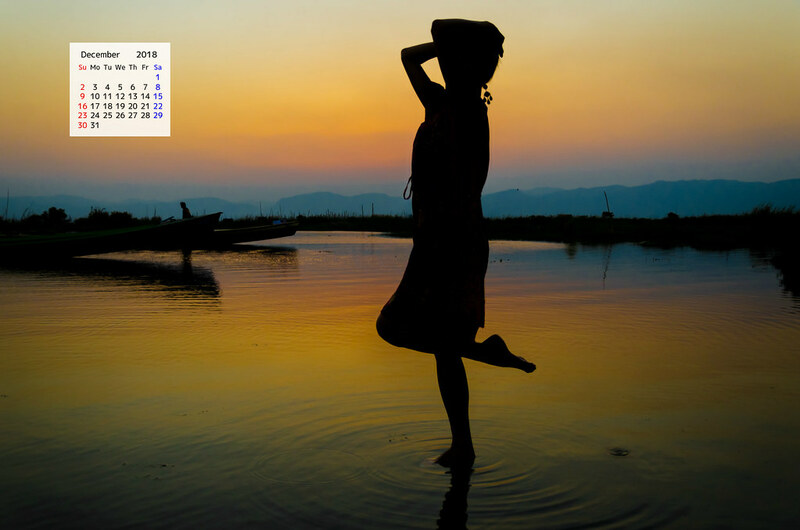 To give you a bit of background of the image for the December 2018 Calendar Wallpaper, we will need to go back to my Myanmar trip to Inle Lake where this image was clicked around sunset. 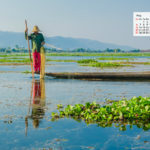 The images from Inle Lake are some of my favorite images from that trip and have featured here on the desi Traveler Calendar many times. I do hope to visit again and spend more time enjoying the natural beauty and understanding the cultural significance of the people who live in and around Inle Lake in Myanmar. 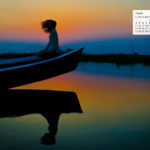 So dear reader, let me give you your free copy of the December 2018 Calendar Wallpaper, that features Yuko Watanabe from Japan at Inle Lake Myanmar. As always the high resolution calendar image is available in 3 sizes and you can right-click on any of the links below to download and save the December 2018 Calendar Wallpaper. 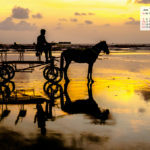 Talking of calendars, I hope you are aware that the annual desi Traveler Calendar contest is on and you can participate in the same by a few very simple steps, that I have mentioned in this earlier post about the 2019 desi Traveler Calendar Contest. Grand Prize > 2 nights complimentary stay for a couple at Sanctuary in the Hills, Jilling, Nainital & 2 copies of the limited edition 2019 desi Traveler Calendar + a Photo Mug with any picture clicked by desi Traveler that you like from the desi Traveler blog or Instagram account. So in total, there are 11 copies of limited edition desi Traveler Calendar to be won 2 for the grand prize winner, 1 for first prize winner and 8 for Calendar Prize winners. 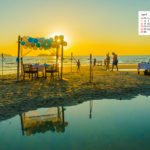 More details you can find in this earlier post > 2019 desi Traveler Calendar Contest Or you can also check the Instagram post below that you need to like and comment with to be eligible for the contest. ***Win Unhotel stay in Uttarakhand & Varanasi*** Hello Travelers, 2019 desi Traveler #Contest is now live. Besides the desi Traveler Calendar the good folks at Unhotel, are giving complimentary stays to 2 of our lucky winners in 2 different Unhotels The top two winners besides the desi Traveler Calendar also get 2 nights of complimentary stay at two of the Unhotels in India. Mandatory Steps to participate in this contest 1.Follow both @desitraveler & @unhotelier on Instagram. 2.Tag 2 of your friends on this INSTAGRAM POST in comments asking them to participate in the contest. To tag more than 2 friends add another comment. Please note in one comment tag only 2 friends. ***Optional Steps to increase your chances of Winning*** 1. Share this post on your social media & tag + follow desi Traveler & Unhotel on other chanels like Facebook, Twitter etc 2.Tag as many friends you would like on various social media to increase your chances of winning *** Prizes *** 1.Grand Prize > 2 nights stay for a couple at Sanctuary in the Hills, Jilling, Nainital & 2 copies of the limited edition 2019 desi Traveler Calendar + a Photo Mug 2.First Prize: 2 nights stay for a couple at Granny's Inn in Varanasi & a copy of limited edition 2019 desi Traveler Calendar + a Photo Mug 3. 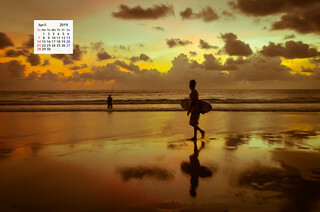 Calendar Prizes: This one is for 8 other winners who each get a copy of limited edition 2019 desi Traveler Calendar delivered to there address anywhere in the world *** Legal Stuff *** 1. The contest is in no way affiliated or supported by Instagram or Facebook 2.DATES: The contest is live & will end on 11:59 PM, 15th Dec 2018 IST. 3.Result: The results will be announced by 11:59 PM, 19th December 2018 4.The Unhotel Stay winners can avail the stay till 31st August 2019 5.Only hotel stay is complimentary. Winners will need to make own arrangements to travel to the destination & the incidental charges like Food, beverages, tips etc. are not covered . 6.The winners will be chosen by me along with the Unhotel team & the decision will be final. 7.We reserve the right to cancel, the contest, or alter Terms & conditions of the contest if needed 8.More detials > Link in Bio 9.Questions? Please comment . 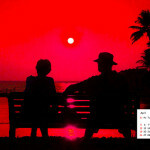 With this let me once again wish you a wonderful December & thank you for being a wonderful reader of desi Traveler blog. I do hope you have liked this post and would request you to share it further on your social media. Also do check, like & participate in the 2019 desi Traveler Calendar Contest, to win some cool desi Traveler Calendars and 2 nights stay with Unhotel in Uttarakhand & Varanasi.